Here at Dry Creek Rat Terriers our dogs are like family. They are well taken care of, registered, come with two rounds of shots, and dewormed. Prefer you to call or text me at 817-694-1345. We believe that form follows function, and function follows form. What this means is that our dogs can do almost anything we ask, and look good doing it. From conformation ring to lure coursing field to hiking the trails with us, or just relaxing on the couch, our Rat Terriers do it all. We raise quality, health tested Rat Terriers and Dobermans. Our focus is on health and longevity, and we show a bit as well. This is a hobby not a full time business. We have puppies available on occasion. 2019 we will have Spring &amp;amp; Summer puppies. We are a small family kennel and breeder of Rat Terriers located in the Piedmont area of North Carolina. Our Rat Terriers are our show dogs, our performance dogs and our family friends. They live with us, travel with us and perform with us. Dr. Robert Oglesby and Janette Oglesby have been in veterinary practice for over 32 years and involved with dog breeding and puppy care. Our high quality Rat Terriers are proof of our expertise. Hobby Breeder for 25 years in California. Grand Champion Bloodlines with both MINIS and STANDARDS. Our family has been loving and raising Rat Terriers for 4 generations back to the early 1920's. We have ONE breed only that we raise. We show our dogs in both UKC and AKC . Earning National Titles helps us validate the quality we try to raise and helps us make better breeding choices. Most of our puppies go into loving pet homes and that's FINE with us. We welcome visitors so you can see how we raise our dogs. They are pets first and show dogs second. Rat terrier puppies that will be ready December 14. Tails are docked. Will be vet checked, have first shots, and dewormer. Will be under 10 pounds full grown. Mom weighs 7 pounds and Dad 10.5 pounds. Home raised rat terriers 4 females and 1 male. Will be between 8 and 10 pounds full grown. Will come with shots, registration papers, and a puppy package. 200 deposit to hold a puppy of your choice. Have white/black tri and white/Sable. contact me for application and more details or more pictures. Both Dam and Sire on site. 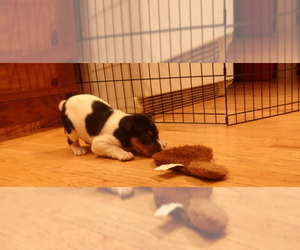 Looking for a reputable Rat Terrier breeder in your area? Simply browse through our nationwide directory of 1000s reputable Rat Terrier breeders - complete with website addresses, dog breed profiles, and current puppies for sale.